"Since 2000, I have been making large-scale installations in addition to my drawings that mainly consist of textiles, craft materials, and discarded household objects. I see these installations as drawings in space with a prevailing sense of line and color. Integral to the world is the idea of accretion, as well as sprawl - multiplying systems of parts that have "run amok." 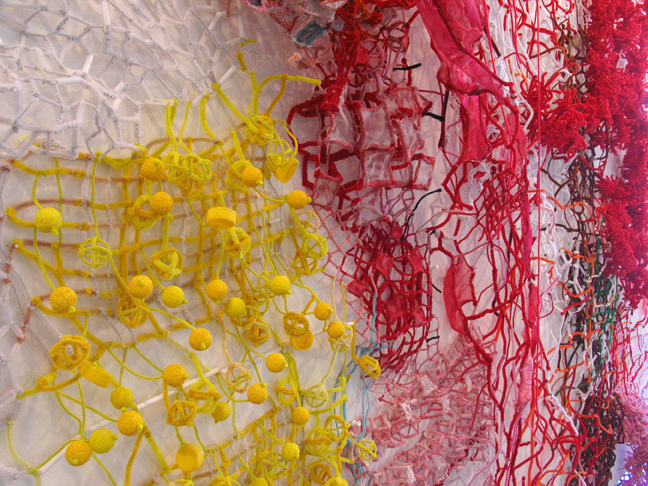 The use of commonplace craft materials (such as pipe cleaners and yarn) and household refuse (such as cleaning bags and fruit nets) give the work a provisional quality and help to undercut its monumentality. Through a labor-intensive process, patches of fabric and plastic are sewn or pinned to structures made of pip cleaners and wire."